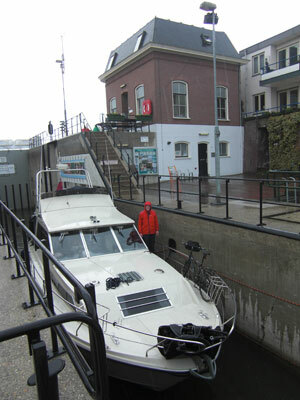 Our winter berth in the Nieuwe Haven in Dordrecht came to an end at the beginning of April, which nicely coincided with my Easter holiday trip. Even though it was forecast for rain, and we had resolved not to cruise in the rain, we couldn't resist taking the long way round to our final destination of Strijensas, and taking a trip up the Merwede to Gorinchem for the weekend. Second World War bunkers have been excavated at De Punt near Ouddorp on the Grevelingenmeer. A circuit of the small Leiden canals is a 'must-do' - joining the crowds in their sloops. Stop off at the numerous quays or bars for refreshment en route, or do as the Dutch do and pack a picnic hamper.